Streptococci are gram-positive bacteria that can be serologically classified as Lancefield groups A, B, C, D, F and G. Symptoms can take up to 24 hours to present and include fever, sore throat, swollen neck lymph nodes, and white or yellow spots on the tonsils with a bright red throat. In some cases, scarlet fever can occur which is not dangerous if treated promptly. Throat culture is the most reliable method to detect a Streptococcus infection. 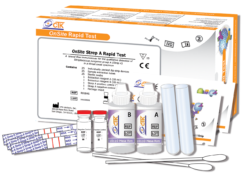 However, cultures require 24-48 hours incubation to allow a reliable diagnosis, therefore, immunochromatographic rapid tests have been developed for the direct detection of group A streptococcal antigen from throat swabs.